Beijing, China: Liberian President George Manneh Weah has pledged that the relations subsisting between Liberia and China will reach new levels under his administration and that Liberia will take all necessary measures to enhance the already strong bilateral relations and cooperation with China as the two countries work together to achieve the mutual aspirations of their peoples. China, an emerging world economic power, is working to afford African nations greater and better opportunities to unlock developments in infrastructure, science, tourism, communication and a wide-range of areas of mutual interest. President Weah said Liberia was determined to work with China and other sisterly African countries to expand this win-win collaboration between Africa and China, and to defend the multi-literalism of the international order and the world free trade system. He also reaffirmed Liberia’s commitment to the One-China Policy, and China-Africa joint collaboration under the “Belt and Road” initiatives, believing that these policies will strengthen the unity and cooperation, which already subsist between China and the developing countries of Africa. The Liberian leader’s comments were contained in special remarks he delivered September 4, 2018 at the close of the 2018 Summit on the Forum for China-Africa Cooperation (FOCAC). President Weah expressed gratitude to China for the resources, opportunities and possibilities the FOCAC presents to Africa and its peoples, and said Liberia was grateful to the Government and people of China for the strong support and assistance it has received over the years. “Through the generosity of China, we have been the beneficiary of many significant infrastructure developments, which have had direct and positive impact on improving the quality of life of our citizens,” the President recalled. 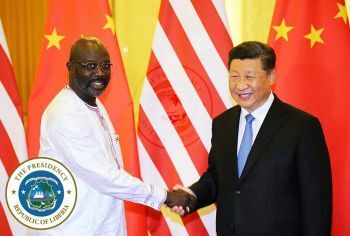 President Weah said the numerous assistance China provided Liberia truly reflects the compassion and humanitarianism of President Xi Jinping, who continues to pay high attention to the epidemic situation in West Africa, and declared that the Chinese government will continue to help African countries fight the epidemic. President Weah also weighed in on the significance the Forum for China-Africa Cooperation (FOCAC) presents the African Continent to chart a new course in its ties with the People’s Republic of China. He acknowledged the new heights China-Africa relations have reached under the leadership of President Xi Jinping, stating that FOCAC provides the leaders of Africa the opportunity to meet and dialogue with the Government of the Republic of China. “There has been a significant increase of investments in infrastructure, agriculture, health, education and public housing, as well as in other critical sectors across various African countries,” the Liberian leader said September 4, 2018 in special remarks at the just ended two-day FOCAC Summit held in Beijing. President Weah said it was imperative for Africans to laud China for its support to peace and security in Africa. China has actively supported the peacekeeping capacity of several member states of the African Union, which has enhanced our efforts and capabilities to solve regional issues independently. Few days ago, China announced a US$54 Million grant to Liberia, as a result of a special appeal from President Weah, to aid the construction of two Overhead Bridges to ease vehicular traffic movement at the Ministerial Complex and SKD Boulevard respectively.